The roof design or roof is the main part of a house. It is what protects us from the weather, the weather, the sun or the cold, the wind and danger. More than walls, a roof over our head is an indispensable protection for humans. We feel vulnerable to the open sky. Therefore, we must take special care when building our home. Whether we do it ourselves or an architecture and engineering firm . Even if it is a house already built, the roof design. Or the roof is a point that must be checked before making any movement, check the conditions of the waterproofing, insulation. And interior finishes, and make the necessary adjustments before any thing. In this book of ideas we present some economical building materials for roof design, both indoors and outdoors. And some ideas to make them look cute. Do not miss it! You can build a beautiful gable roof design without the need for large steel hulks or expensive wooden structures. The strength of this structure consists of the sum of the struts below the plates. This option consists of arming metal aluminum profile trusses, it is an extremely light material. And it can load perfectly sheets of special drywall for exteriors, which are insulated and waterproofed. An effective option for terraces or for service patios and Elastoplast is to install a structure of metal profiles. It is very light and easy to place, by means of angles that are anchored to the walls or side fences. Above them, which should be no more than 60 centimeters apart, the acrylic plates are seated. These can be engraved or ground, or opaque to allow a homogeneous and subtle lighting. The wood structures covered with slats or wooden plates are classic for their ease of installation and cost. Since economical and resistant wood is used as cured pine. 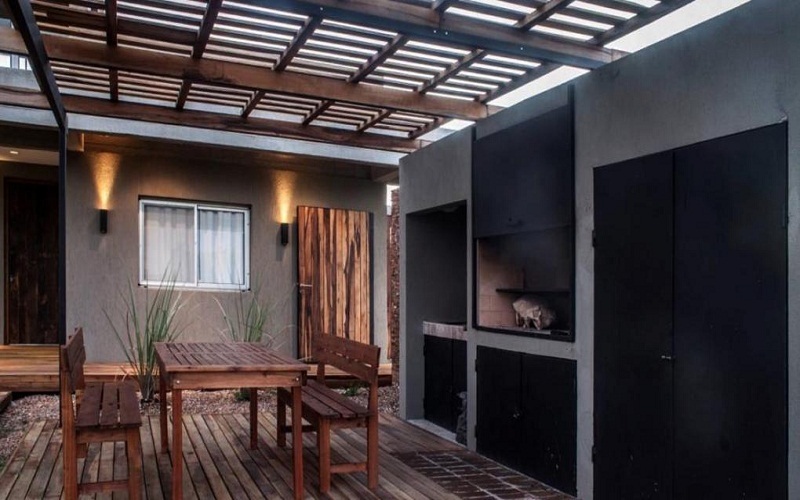 The idea of ​​an economic wooden cover is to leave the structure exposed but so that it does not look so rustic. If it is not your taste, you can paint it in a neutral color either white or cream, to blend the pieces. And beams with the complete clearing . Do not forget the exterior waterproofing design, it is indispensable! Clay brick is a very noble, cozy, warm, beautiful and structurally reliable material under certain circumstances. One of them is the work of roof vaults. The shape of the brick found on joists gives it support. And strength, as well as generating an original design and handling the appropriate light and climate. It goes without saying that brick is one of the most economical materials in the market. As the construction of the previous point, in this case the vault has received a coat of paint to exalt the style and color of the place. 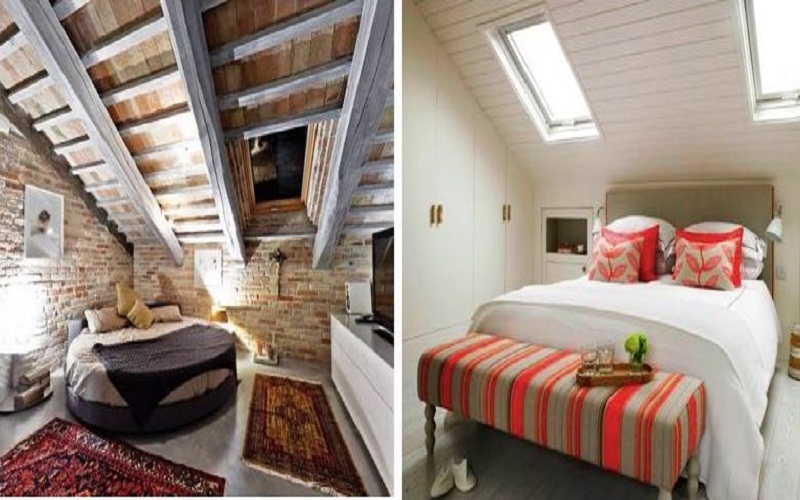 It is a good decorative resource to send attention to the brick walls or the wooden floor. Or to the art on the walls, or simply to reflect the natural light that enters through the windows. Leaving the apparent structure, this roof design is excellent for terraces or extensive galleries of the house. It is a very simple structure with wooden beams and thin bars every 60 centimeters, with slope to 2 or 4 waters. On the structure the tiles of mud settle directly. Or they can be of manipulate with small plates of wood seated one on another. It gives a fresh and cozy atmosphere to the place. The ceilings in the patios and terraces can be very cheap and simple structures, as they are not supposed to carry machines or weight of any kind. A good option is to build a structure with steel bars, a grid with columns and sides. And angles in between. On this structure can be placed some planks or thin bars transversely and on them secure reeds. Or small rods of dry cane or bamboo to protect from the sun without limiting the light or ventilation. A variant of the previous structure is to place fabrics instead of acrylic. And in such a way that they can retract and allow the sun to enter or close and avoid sunning. One of its advantages is that fabrics can be easily replaced. Or removed, washed and reassembled and pensioned to function properly. Although concrete is not the most economical material. It can be considered that way as long as. It is used in a monolithic structure with the indicated steel and without major finishes. 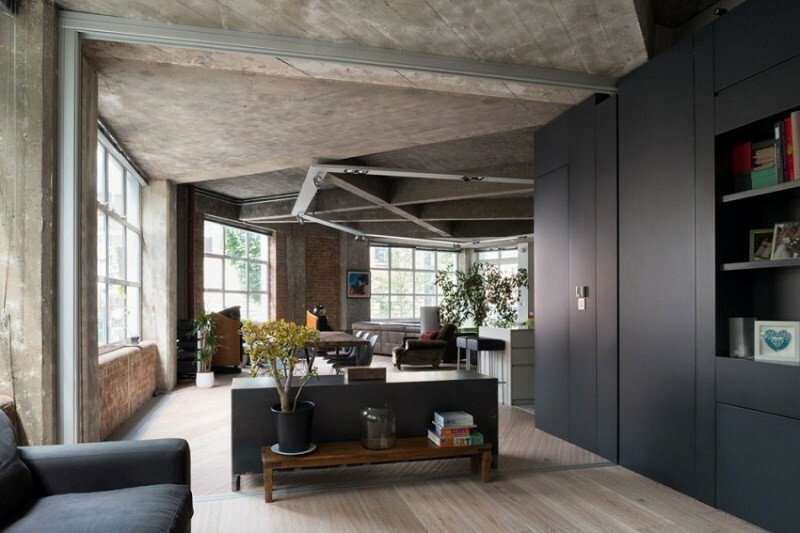 The idea is that the slab towards the interior is shown naked, leaving the apparent electrical installations by means of rails and cables supported. On the outside it must be insulated and properly waterproofed. By not having ceiling, duct and interior finishes you can save a good sum of money. And use it to install modern industrial style luminaries, does not it sound better? This slab consists of a steel and concrete assembly forming a series of transverse and longitudinal beams. And between them the insulating material, preferably polystyrene, is placed. Below and laterally, wooden shoring must be placed, for the enclosures and for loading the slab. Once the forms are secured, the concrete is injected onto the structure. Underneath it must be perfectly shaded and supported by bars to prevent the concrete from hanging or breaking when it sets. This cover can work on its own as a structure. 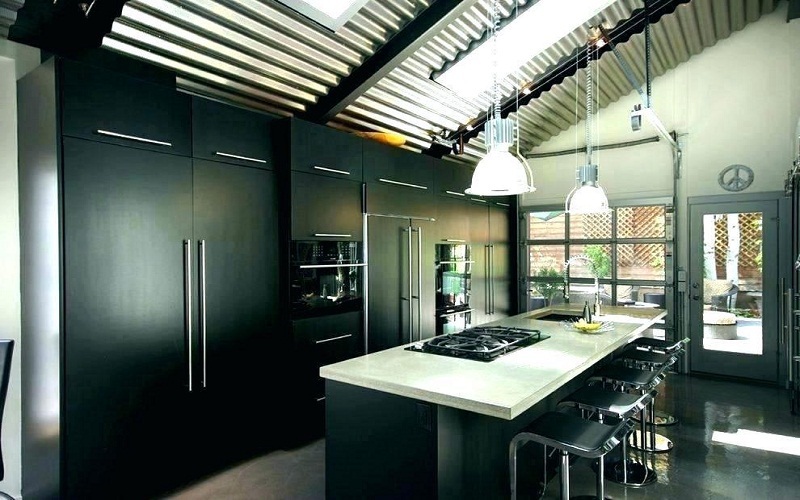 And as a ceiling, due to the versatility of its material, design and format. It is perfect to give an industrial. Or contemporary touch to the house, where a series of steel bars hold plates of corrugated sheet of the design of your preference. It is necessary to cover the structure with special paint for steel, anti corrosive. And non-toxic since it will be inside the residence. On the outside you must ensure the precise waterproofing for the region. Inside, the roof design of the gutters will create perfect shadows and supports for very original luminaries.